Volcano is a vent in the crust of a planetary-mass object, such as Earth, that allows material warmer than its surroundings to escape from its interior. Ninety percent of the world's earthquakes occur along the Ring of Fire. When this material escapes, it causes an eruption. An eruption can be explosive, sending material high into the sky. Or it can be calmer, with gentle flows of material. These volcanic areas usually form mountains built from the many layers of rock, ash or other material that collect around them. On Earth, the erupted material can be liquid rock (“lava” when it’s on the surface, “magma” when it’s underground), ash, cinders, and/or gas. Volcanoes are classified into many types. These types are composite volcanoes, cinder cone volcanoes/ ash cinder volcano, shield volcanoes, lava domes/ domes, fissure volcano, and caldera volcanoes. Earth has over 1500 active volcanoes. Volcanoes can be active, dormant, or extinct. • Active volcanoes are volcanoes that have had recent eruptions or are expected to have eruptions in the near future. • Dormant volcanoes no longer produce eruptions, but might again sometime in the future. There are probably millions of volcanoes that have been active during the whole lifespan of the earth. During the past 10,000 years, there are about 1500 volcanoes on land that are known to have have been active, while the even larger number of submarine volcanoes is unknown. The largest active volcano is the Mauna Loa in Hawaii which is over 13, 600 feet above sea level. A volcanic eruption is an awesome display of the Earth’s power. Yet while eruptions are spectacular to watch, they can cause disastrous loss of life and property, especially in densely populated regions of the world. There are three different categories of volcanoes: active, dormant, and extinct. The danger area around a volcano covers approximately a 32-kilometer (20-mile) radius however some danger may exist 160 kilometers (100 miles) or more from a volcano. About 350 million or one in 20 people live within danger range of an active volcano. The greatest number of the Earth’s volcanoes occur on the ocean floor. The Ring of Fire is a 40,000 kilometers (25,000 miles) horseshoe shaped area in the basin of the Pacific Ocean. It has 452 volcanoes (more than 75% of the world’s active and dormant volcanoes). Eruptions are what cause a volcano to get bigger. 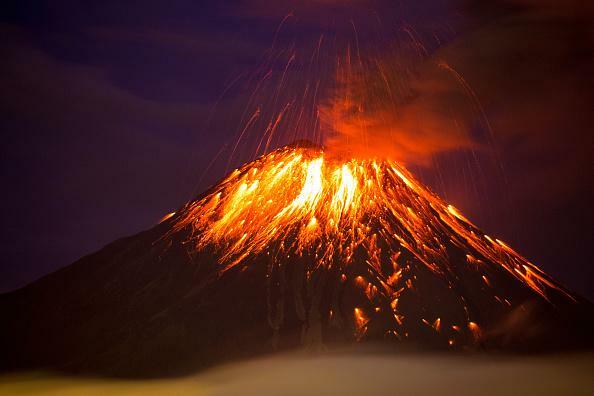 Between 10 and 20 volcanoes are erupting somewhere on Earth every day. Hiding beneath the massive Antarctic Ice Sheet lies one of the densest clusters of volcanoes in the world. In total, 91 new volcanoes were discovered from a recent study, adding to the 47 already identified volcanoes. Mauna Loa is one of five volcanoes that form the Island of Hawaii in the U.S. state of Hawaii in the Pacific Ocean. It is the world’s largest and one of its most active volcanoes. Mauna Loa is 4,170 meters (13,680 feet) above sea level. From its base below sea level to its summit, Mauna Loa is taller than Mount Everest. At 90 kilometers (60 miles) long and 50 kilometers (30 miles) wide, it makes up half of the entire island. There are volcanoes on the ocean floor that create new sea floor. The world’s largest underwater volcano, Tamu Massif, is the size of New Mexico. Parícutin is one of the seven natural wonders in the world and is located in Michoacan state, Mexico. It is the youngest volcano in the Western Hemisphere and the reason for being named a “wonder” – its birth was witnessed and studied by people. An erupting volcano can cause other natural disasters such as earthquakes and tsunamis to occur. Volcanoes can form over mantle plumes which are areas of hot rock under the surface of the Earth. In 1883 Krakatau in Southeast Asia erupted, releasing 200 megatrons of energy, the equivalent of 15,000 nuclear bombs! This generated the loudest sound reported in history. Volcanic eruptions can send ash high into the air, over 30 kilometers (17 miles) above the Earth’s surface! Over 75% of the world's volcanoes are located in the Ring of Fire. The temperature of lava when it is first ejected from a volcanic vent can vary between 700 and 1,200 degrees °C (1,300 to 2,200 °F). Located in East Java, Indonesia is a volcano that spews blue colored flames. Sulfur combusts on contact with air to create stunning blue lava-like rivers of light in the Kawah Ijen crater. In order for a volcano to erupt, it must be over a hot spot. Volcanic lightning is a weather phenomenon that is related to the production of lightning in a volcanic plume. It is one of nature’s most epic displays. A study in the journal Science indicated that electrical charges are generated when rock fragments, ash, and ice particles in a volcanic plume collide and produce static charges, just as ice particles collide in regular thunderstorms. The Ring of Fire is a ring of volcanoes that circle the Pacific Ocean. Pompeii was an ancient Roman city near modern Naples, in Italy. Pompeii was destroyed and buried under 4 to 6 meters (13 to 20 feet) of volcanic ash and pumice in the eruption of Mount Vesuvius in 79 AD. The eruption occurred on 24 August 79 AD one day after the religious festival to Vulcan, the Roman god of fire. The word “volcano” is derived from the name of Vulcano, a volcanic island in the Aeolian Islands of Italy whose name in turn comes from Vulcan, the god of fire in Roman mythology. The study of volcanoes is called volcanology, sometimes spelled vulcanology. Magma is molten rock inside the volcano and lava is when the molten rock comes out of the volcano. Many ancient accounts ascribe volcanic eruptions to supernatural causes, such as the actions of gods or demigods. To the ancient Greeks, volcanoes’ capricious power could only be explained as acts of the gods, while 16th/17th-century German astronomer Johannes Kepler believed they were ducts for the Earth’s tears. Mount Fuji is the tallest mountain in Japan and is also a dormant volcano. Active volcanoes in the U.S. are found mainly in Hawaii, Alaska, California, Oregon and Washington, but the greatest chance of eruptions near areas where many people live is in Hawaii and Alaska. The enormous volcano sitting beneath Yellowstone National Park and is sometimes referred to as the Yellowstone Supervolcano. It has an enormous crater that measures about 55 by 72 kilometers (34 by 45 miles).No one really knows when the Yellowstone supervolcano is going to erupt again. The last three big eruptions at Yellowstone were 2.1 million, 1.3 million, and 630,000 years ago. It may come as a surprise, but the largest known volcano in the solar system is actually on the planet Mars. It’s called Olympus Mons and is also the highest point on on the planet Mars. It measures a whooping 600 km (373 miles) wide and nearly 22 km (13.6 miles) high.